Development over winning can be a difficult concept for young players and inexperienced coaches to focus on. Developing youth players skill and understanding of the game will result in wins later in the players careers. Smaller sides games such as 4v4 helps keep all players on the field involved and moving. Players are able to gain confidence which in turn increases their touches on the ball. It is important to the development of the youth player to include 1v1 drills during training. 1v1 is used as a building block to the development and understanding of the game. Know when to coach and when NOT to coach. Never coach in the moment or when the player has the ball. Do not create joystick players. Let them think and react for themselves. Coach the players around the ball for shape and or positioning. If you need to coach the player with the ball wait until after the play is over and then make your coaching point. Resist keeping score to help parents remain calm and not become over bearing. Having players take risks like dribbling out of the back without the fear of losing the game or being screamed at by the spectators on the sidelines. Having a player realize dribbling out of the back is not always a great idea instead of the player being yelled at helps them develop and become a smarter player. It is a well-known fact among soccer professionals that futsal develops players who are technically sound—capable of thinking and reacting with incredible speed and efficiency. Some of the world’s greatest soccer stars grew up playing futsal, which is why we at Placer United Soccer think it’s essential training for your child. Our 27,000-square-foot indoor facility in Rocklin features four turf fields with no walls. The absence of an enclosure means that players are constantly placed in demanding situations that require quick decisions, excellent control of the ball, and precision passing. When walls are leveraged into play, it’s easy to develop bed habits that will be of no use on an outdoor soccer field. On average, futsal players touch the ball 210 percent more than those who play traditional indoor-arena soccer. Given the limited space, boundary restrictions, and constant opponent pressure, a player’s ball control skills and technique are strengthened. With no walls to rely on, players must use tactical awareness and creativity to move and support one another. Over time, they will create triangles on the field—the simple formula behind Barcelona’s success over the last decade. The United States Soccer Federation endorses futsal as the key component to unlock future players’ full potential, and we couldn’t agree more. By offering futsal training, we help our players become more technical on the ball so they approach each game with an abundance of confidence. Balance and motor ability. Agility and coordination. Fast and accurate passing and receiving. Heightened perception and awareness. These are some of the soccer skills that your child will develop by playing futsal. Perhaps best of all, these increased abilities add up to a greater enjoyment of the game—and isn’t that what youth sports is really all about? 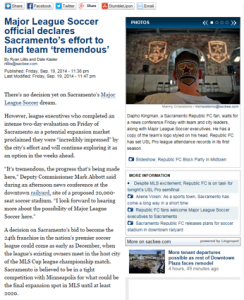 A decision on Sacramento’s bid to become the 24th franchise in the nation’s premier soccer league could come as early as December, when the league’s existing owners meet in the host city of the MLS Cup league championship match. Should things go well, California can soon welcome a surge of soccer enthusiasts and aspirants looking for a piece of the action. This, in turn, will prompt the need for more suitable training facilities that teach young athletes how to play with the big boys and even kindle their desire to go pro. A Rocklin youth soccer organization like Placer United can fill this role by offering soccer clinics and summer camps where kids of all ages get to know what it takes to meet the Major League’s standards, well beyond fancy footwork. Good team coordination is also a vital skill all aspiring soccer players should learn to achieve a measure of competence fit for MLS. For example, simply passing the ball isn’t as easy as it sounds. Players must have the skills to pass the ball straight to their teammates from every direction, and should also know when not to pass the ball if there is a good chance that the opposing team will be able to intercept it. Major leagues all over the world like the MLS also put emphasis on specialized training so that all players would have a solid grasp of their respective roles. Aside from hosting a Rocklin indoor soccer clinic, an organization such as Placer United also has a special training camp that molds goalkeepers into better savers and blockers. The MLS is always looking for such skills among its athletes. Here’s hoping that Sacramento would get the League’s pick as its latest franchise. But if the most prosperous nation in the world soccer fraternity is eventually going to back up its resources with appropriate results on the game’s largest stage, the talent level will have to rise markedly, and it’s likely going to have to be today’s youngsters who ultimately make it happen. Some might even be involved in the AYSO National Games currently taking place in Riverside and in Torrance. To get ahead of the international competition, USA’s future Chivas players must train wherever and as often as they can. A youth soccer organization like Placer United can provide such an opportunity by organizing Rocklin soccer camps, clinics, and tournaments for kids aged five and up. These venues enable young athletes to learn the ropes with the help of seasoned soccer professionals, which should serve them well as they hone their skills and master essential techniques. One particular skill young soccer players need to learn is ‘heading’: striking or passing a ball using the player’s forehead. Heading is essential for both defensive and offensive strategies in the field, as it is the only way to clear the ball far away and out of the reach of opponents. That said, this skill is not without hazard. Heading is a major cause of head concussions in both the 2014 World Cup and other minor leagues. While heading injuries occur mostly due to improper form or excessive force, heading can also put players in direct contact with other players, often with damaging results. The correct way for a player to head a soccer ball is to use the back and stomach muscles. As the ball approaches, the player’s back must be arched so that it lands between the eyes and above the hairline. Once contact is made, the player must then lean slightly forward to force the ball away. Timing is extremely important to pull this off, which is something kids can learn by participating in Rocklin indoor soccer clinics aimed at developing coordination, agility, speed, balance, and strength, among other things. As more kids develop this skill, fans of the sport can only look forward to a bright future for American soccer. Athletes know that maintaining strong muscles and bones is the best way to prevent injuries while playing sports. But strengthening your joints and ligaments play a huge role in keeping your body in good physical condition, too. The most common type of ligament injury happens in the ACL, or anterior cruciate ligament, which is one of four ligaments in the knee. ACL injuries are most common in sports that require a lot of quick feet movement and twisting, such as basketball, football, and soccer. Soccer players and parents of young ones participating in a Rocklin soccer program should take extra care to prevent these injuries. Here are 4 ways for you or your children strengthen the ligaments to avoid injuries. Extremely important for any sport, stretching should be done before and after physical activity. Ensuring that you or your child is stretching properly is equally important. Focus on each muscle in your legs individually, including the calves, quadriceps, hamstrings, inner thighs, and hip flexors. Don’t overstretch, or you’ll risk pulling muscles. Skipping the stretching phase often increases your risk of injury later on. Doing isolated exercises such as lunges and single toe raises will help strengthen your muscles and ligaments. These exercises can also improve your balance, which will help to prevent injuries. These exercises are slightly higher impact, so you’ll want to do them on a soft surface, like a padded gym floor or soft grass. Do several reps of back-and-forth jumps over a line or a six-inch cone. Be sure to accept the weight on the balls of your feet, and keep your knees slightly bent to better allocate the pressure. Since these exercises have a cardio element as well, be sure to keep yourself hydrated. Fast and accurate footwork is the key to becoming a great player in any Rocklin youth soccer programs. Practice your agility by performing shuttle runs, diagonal runs, and bounding runs. Again, remember to keep your knees slightly bent and accept the pressure of each footfall on the balls of your feet, and keep drinking water to stay hydrated. Practicing these five simple exercises will not only improve your game, but it will also help you make an investment in the future health of your ligaments, joints, muscles, and entire body. Soccer, or football, as it is more commonly known elsewhere in the world, has recently been growing in popularity in the United States. Once reserved only for younger children and female players, the sport is gaining wider acceptance among the general public, and a growing number of youth male players—many of whom played soccer during their younger years before moving on to other sports—are coming out of the woodworks. The growing interest in the sport is not confined to players, however. As noted by many sports experts, the popularity of soccer is quickly gaining traction and the sport’s fan base continues to grow year after year. In November 2013, Forbes published an article that highlighted Major League Soccer’s (MLS) surging popularity—a stark contradiction to its failing state just 10 years prior. As shown by statistics posted at that time, the MLS was already nipping at the heels of the NHL in terms of popularity. Still, no one can really point at one particular reason for the massive boost in following that the MLS is enjoying. In New York City, soccer is also gaining a foothold among fans in creative circles, where being soccer-savvy has suddenly become fashionable. For fans in the city, the drug of choice isn’t the MLS, but the English Premier League—rich, unadulterated soccer at its finest. This trend is being mirrored locally as well. In Placer County, California, soccer club board members are buying into the sport’s growth in the region. 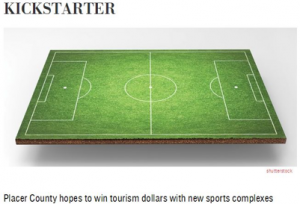 Local business insight monthly Comstock’s Magazine revealed that Placer United, a Rocklin soccer club, would be developing a massive sports complex in nearby Lincoln in partnership with developer Richland Communities. Set to include 12 soccer fields, three outdoor futsal courts, and two training areas, the development is expected to fill the need for large-scale sports centers that will cater to both fans and players of the sport. The club already plays on several designated fields, including a Rocklin indoor soccer training center on Tinker Road. With the new development and exploding interest in the sport, it’s almost obvious where this is heading—and for everyone involved, it’s a very rosy picture indeed. Two Placer United girls teams secured top 1-8 spots in the state and will advance in Norcal State Cup. The U11G ’03 Red had a pair of victories in group play on Saturday and won their group. They advanced to the Elite 8 for the second year in a row. In game one, the girls defeated MVLA Lightning Blue, 3-1. In game two, the girls had a convincing 7-1 victory over DeAnza Force. The quarter-final was played on Sunday and the girls came out victorious with a 1-0 win over Milpitas. They now advance to the State Cup semi-finals versus West Valley Magic on January 25th. The U13G ’01 Red finished up group play with a 0-0 draw versus Livermore to win their group and advance to the Top 8 in the state. This is their second consecutive trip to the Elite 8. They play in the State Cup quarter-final match next Saturday the 18th versus Cal Odyssey. The U11G 03′ White had a draw and a pair of close defeats to advance to the quarter-finals of the Diamond 2 division. In the quarters, they played the Central Valley San Jose Mercury Red. It was a nail-biting game and the girls came out with a 2-1 win in golden goal overtime. They now move on to the semi-finals versus Tracy on January 25th. The U12G ’02 Red had a pair of 0-0 draws in their final group play games and move on to the Premier 3 quarter-finals versus the Walnut Creek Inifnity next Saturday the 18th. Congrats to all of these teams on an excellent weekend! What a great weekend for all the Placer United players who were selected to play for Cal North teams at the 2014 ODP Region IV Championships held this past weekend at the Reach 11 Sports Complex in Arizona. Placer United boys players on the Cal North 2001 team that made the Region IV semi finals included Cade Mawson and Dominic Paielli. The Cal North 1999 boys team with Placer’s Ryan Branigan also made it to the semi finals. Placer United had standout goalkeeper Jay Roundtree between the sticks on the Cal North 1998 boys team. Placer United’s Emily Talmi and Lindsey Porter represented Placer United on the Cal North ODP 2000 girls team that also made it to the Region IV semi final game. Maggie Bell made it to the final playing for the girls Cal North 1998 ODP team. Three Placer United teams played in the Norcal State Cup playoffs this past weekend. The U11B Red had a pair of victories to advance to the State 1-8 quarter-finals. In group play, the boys defeated North Bay Elite 2-1 and Heritage 3-0. In the quarter-finals, the boys defeated the Monarcas 4-1 to advance to the semi-finals on January 25th. The U13G Red played in the State 1-8 quarter-finals. Despite a barrage of scoring opportunities, the girls were up-ended 3-1 by Cal Odyssey. In the 5-8 playoffs, the girls lost a heartbreaker to Mustang 2-1. They will play for 7th/8th place in the State on February 16th. The U12G Red played in the quarter-finals of the Premier 3 Cup on Saturday and came out with a 3-1 victory over Walnut Creek. In the semi-finals, the girls defeated Peninsula Odyssey 1-0 to advance to the final on February 15th against the Central California Soccer Alliance. Congrats to the teams on a great weekend!